Jim Glazner, with his late mother Mary Anne, in a photo taken in 2011. Glazner said he’s looking to sell Smith’s Variety, though he said it’s important that new owners maintain the connection to the community and dedication to service that have made Smith’s special to so many people. Journal file photo. 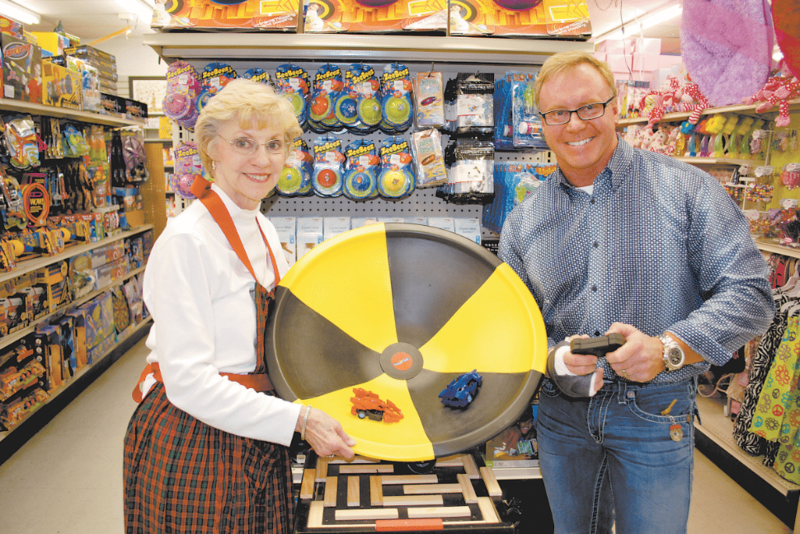 It’s been 67 years since Smith’s Variety first opened its doors, and in that time the toy and gift shop has become something of an institution for generations of Mountain Brook families. But change is in store for Smith’s “very soon,” said owner Jim Glazner. He’s looking to sell the business, though he said it’s important that new owners maintain the connection to the community and dedication to service that have made Smith’s special to so many people. Glazner grew up with Smith’s Variety, too. His parents, Lit and Mary Anne, bought the store in 1976, and Jim started working in its storeroom when he was 16, eventually taking a full-time job at the store in 1980. He said his parents instilled in him the guiding principles that they used to shape the business — in particular, an ethos of selflessness and generosity. There’s a seemingly bottomless well of anecdotes Glazner draws from to illustrate those principles, many of which focus on times Lit and Mary Anne stretched the concept of customer service far beyond its typical definition. He remembers a story from his teenage years of his father receiving a call on Christmas Day from a customer who had purchased an electronic pinball machine for his son from Smith’s. He was having difficulty assembling it, he told Jim’s father. Lit decided to drive over to the customer’s house to help. Lit died in 2003 after a long illness, leaving Mary Anne in charge of the store. Her commitment to helping others remained as strong as ever. When she found out a local child was fighting cancer, Glazner said, she collected donations from customers to help, giving out purple ribbons to be hung outside so that the boy could see all the support he had in the community. There are dozens of examples like this. And even now, he said, people still come up to him with new stories of his mother’s generosity and compassion. Mary Anne passed away unexpectedly in April, leaving behind a void that has been difficult to fill, both in the lives of the people who loved her and in the day-to-day operations of Smith’s Variety. Her absence, Glazner said, has necessitated the sale of the store. Glazner works full-time at Prescription Aesthetic and Wellness Spa, a Vestavia Hills-based cosmetic medical center that he founded in 2007. The commitments of that job prevent him from dedicating enough time to the store, he said, so he’s begun looking for someone else to take over. “In an ideal world, you would make money off the sale of something like this,” he says. But he’s more concerned with maintaining the store’s continuity. He plans to help the buyer of the store get their footing, paying off the business’s existing debt and providing free-of-charge consultation. Glazner said he hopes to sell the store by September, and though there is not a confirmed buyer, two employees hope they’ll be able to muster the resources to buy the store themselves. Steve Sudduth, who has worked at Smith’s for 20 years, said that he and his wife, Katherine — who also works at the store — are hoping to buy Smith’s from Glazner. “We’ve been going through several different channels and talking to more investors,” Sudduth says. “We’re still looking for the right people to invest in it… We know how to run this business and manage it, but there are other aspects a little deeper, accounting-wise, that we just need a little expertise. Though the Sudduths are still working through the logistics of purchasing Smith’s, Glazner said they “just make sense” as the store’s future owners. “I need somebody that keeps Smith’s going, has been here … . Someone who understands it and understands people,” Glazner said. The store is “my family’s legacy,” he said, and it’s essential that any owner stick to the business philosophy that made Lit and Mary Anne — and Smith’s Variety itself — such beloved parts of their community.